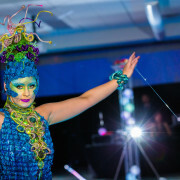 Biomimetic Bride was created by Catherine Hazin, Kelly Hofer & Dianne Gibson. Catherine Hazin is originally from Edmonton and moved to Calgary to attend ACAD in 1997. “I have an interdisciplinary BFA from ACAD, and my major was metalsmithing, and my minor was textiles. 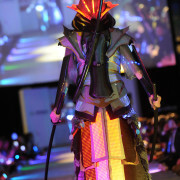 I have always had a passion for fashion design, in particular wearable art. I owned a jewellery design business for 10 years, and taught metalsmithing for 3 years before changing careers to work for the Alberta Ballet. I now work as Editor of Luxe, and Senior Writer for Calgary Bride. I am co-owner of Metalabs, an artistic production company. I have been involved with MakeFashion since approximately November 2013, shortly after Endeavor Arts hosted an art exhibition which I curated for the Canadian Space Society titled “Revolutions”. I happily assumed the role of Fashion and Performance Coordinator for MakeFashion because of my love for performance art, fashion design, artistic direction and of course an interest in technology. Our piece had many sources of inspiration, and it transformed many times from its conception to its realization. 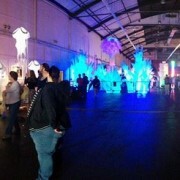 It was at an el-wire workshop hosted by Endeavor where I first met and approached Kelly to form a design team. I (a novice to electronics) had a very basic idea for a space inspired garment that used accelerometers and proximity sensors. 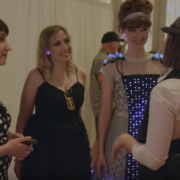 Kelly, who was more familiar with electronics, had an idea for a dress inspired by jelly fish, roots, and utilized modern fiber optic technology and a pulse sensor. Finally, after many inspired discussions and countless hours researching ideas and modern designs, we agreed that we would both really like to make a wedding dress! We promptly went to Cats Eye Vintage, and also to Cameo and Cufflinks, and we searched for dresses for inspiration, then we hunted down fabrics and other materials for weeks afterwards. 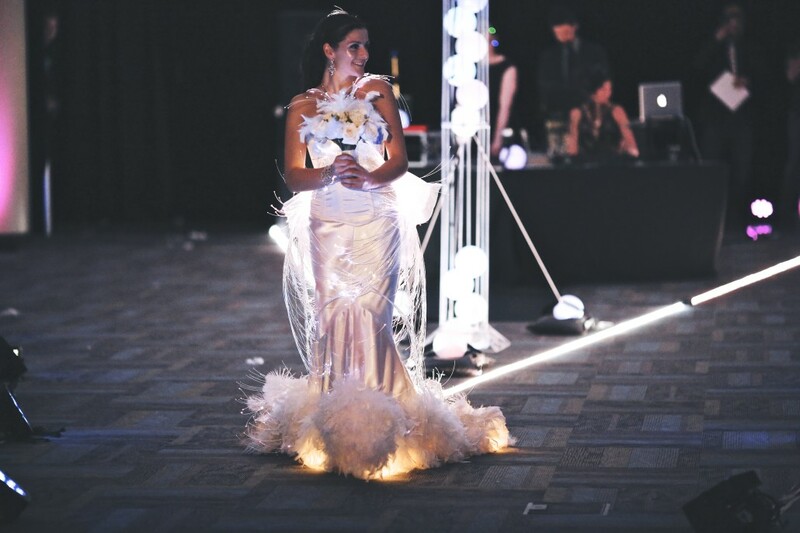 Kelly designed 3D printed modules which were printed by Shannon Hoover to connect the high powered LED lights to the fibre optic bundles, and I designed a contemporary wedding gown, with feather flourishes. We asked Diane Gibson to join our team on January 17. She expertly built a beautiful white satin corset and belt for our ensemble, a foundation for us to create upon. The final dress design was arrived at by Catherine Hazin, with couture corset and tech belt by Diane Gibson, technology design, assembly, and 3D printing by Kelly Hofer, Leaf shaped bustle by Lia Golemba, model Katherine Mandolidis. The Biomimetic Bride was modeled by dancer, Katherine Mandolidis, from Trip The Light Dance and Performance Company. I do often love to use professional dancers whenever possible, as I find that they are dynamic and innovative and offer a storytelling element. I am a great supporter of performance art and dance in particular, and I love to find new ways to combine dance with other art forms. Our biggest challenge was time, and trying to decide between too many amazing ideas. Other than that, we had the ultimate team and could not be happier with the entire process. The 2014 MakeFashion wearable technology show brought to you by OnConference in March 2014 had over 400 attendees and showcased an inspiring collection of local and international wearable technology. 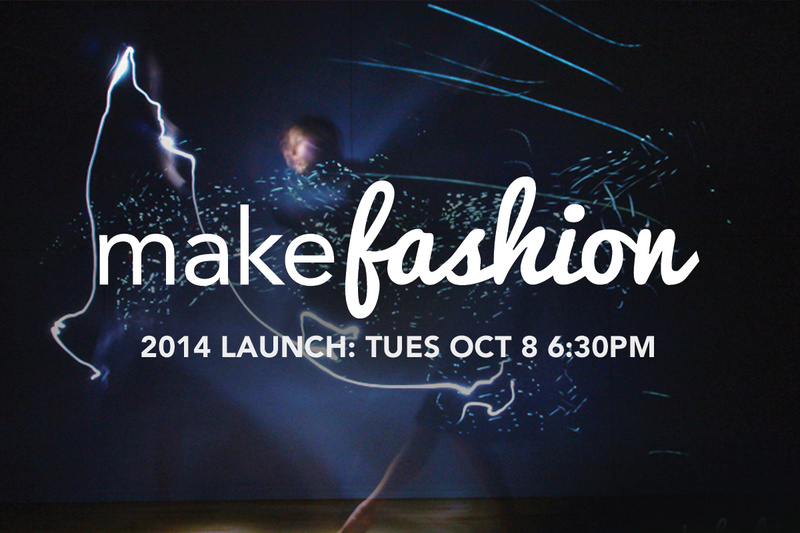 E-mail info@makefashion.ca for information on how to become involved as a volunteer, designer, tech enthusiast, or sponsor.